These refrigerator pickles are 1) a great way to use up garden zukes; 2) super easy; 3) sweet and soury deliciousness. I highly recommend you make some immediately. Combine sliced zucchini, sliced onion, salt, ice and water in a large bowl to soak for an hour. Meanwhile, make your brine. In a pan, combine vinegar, sugar, dried mustard, mustard seeds and turmeric and boil. Reduce heat and simmer for a few minutes. At this point, the recipe says to put the veg into a jar, but I used these handy-dandy plastic food containers from restaurant supply. They are awesome and versatile. 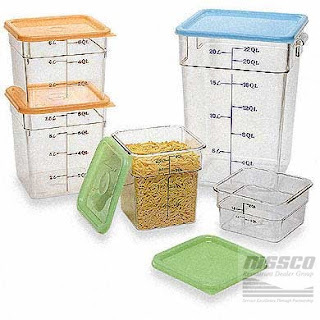 Containers such as these–mine were purchased at Economy Restaurant Supply on Richards Blvd here in Sacramento. Here’s what it looks like full of zucchini! Leave them for at least a day, a few days is best. They’ll keep for 3 weeks in the refrigerator. A perfect accompaniment to your terrine, or just a sandwich. In a shallow bowl, combine zucchini, onions, salt, 5 cups water and 3 cups ice cubes. STir till salt has dissolved; let sit at room temperature for 1 hour. Drain vegetables; pat dry with towels. Put vinegar, sugar and spices into a saucepan and bring to a boil. Reduce heat and simmer for about 3 minutes. Let cool. Transfer zucchini mixture to a 1 quart jar (OR plastic container) and add vinegar mixture, stir. Cover and refrigerate for 1 day before using. Will keep in refrigerator for up to 3 weeks.